This Baked Chicken Fajitas Recipe is my go-to for an easy dinner. With only a few ingredients and one casserole dish, this Mexican inspired meal can be prepped and in the oven in as little as 15 minutes. 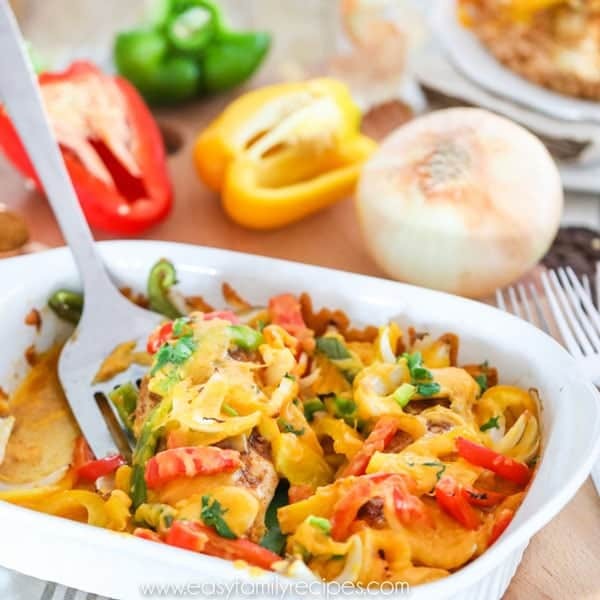 With how easy this chicken fajita bake is to make, you won’t believe how delicious it is and how much flavor is packed into every bite. This is a recipe that is on our regular rotation for a good reason! These baked chicken fajitas are the first recipe on this site for a very important reason! They embody everything I want Easy Family Recipes to be about. This recipe is mostly healthy. This recipe is insanely delicious. I started blogging almost 5 years ago at The Pinning Mama and at that time I had no idea what I was doing but just knew I needed an outlet to share all the creative stuff I was doing with my kids and family. I still share a lot of ideas of there, but I really felt like I needed a place to share just delicious food. Not stuff that looks good but is really not something you would ever make, but the kind of food that you really can make every day. Even when you have 3 kids, and after school activities, and long hours, and spouses that work all the time, and you live far from family and never get any help with any of it. Or even if you don’t! Just real food with simple ingredients that is easy to make and really enjoyable to eat. You can read a bit more about my mission in the about me section if you are interested! Enough of the why… let’s get to the how… you are going to love this recipe! This isn’t a traditional chicken fajita recipe. In this baked chicken fajitas recipe you bake the chicken breast whole. 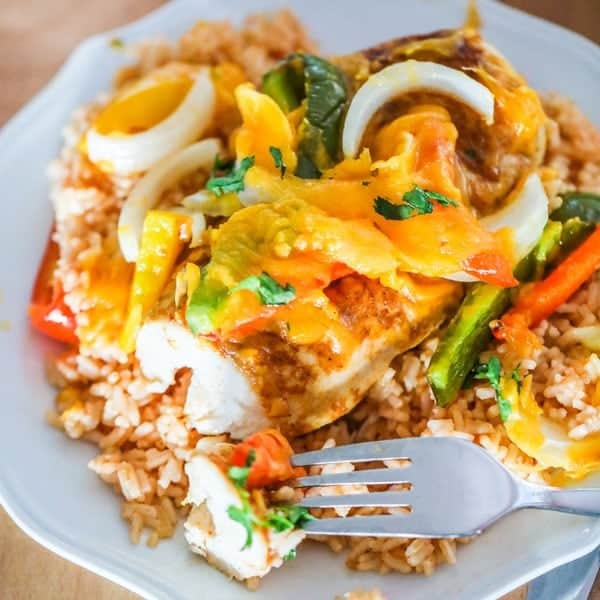 Although you can cut the chicken into strips after cooking, and eat with tortillas or however you want, I usually serve the chicken fajita bake as a whole chicken breast on top of rice. You get all the flavors of fajitas in a fraction of the time, making a really easy recipe! With only 5 every day ingredients, you can have it from the fridge to the oven in just a few minutes. I often get asked if you can make this in advance and freeze it. The short answer is that while yes, you can, it is such a quick recipe, I encourage you to just make it fresh. If you want to save time, a great thing to do is precut the veggies so that they are already ready to go or buy them already prepped. Many super markets will sell bell pepper and onion already cut in the refrigerated produce section. I will shred and freeze the leftover fajita chicken (on the rare occasion we have leftovers, or if I double it just for this purpose) to use to make enchiladas, tacos, or tostadas quickly on another night. 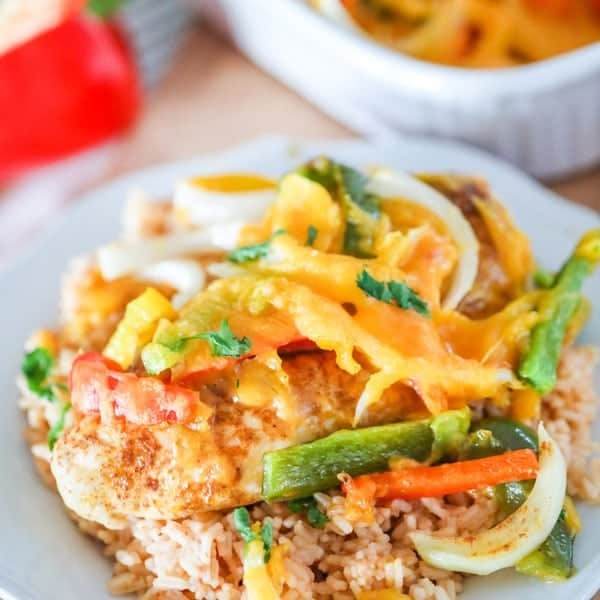 If you are looking for crock pot chicken fajitas, check out Cooking Classy! 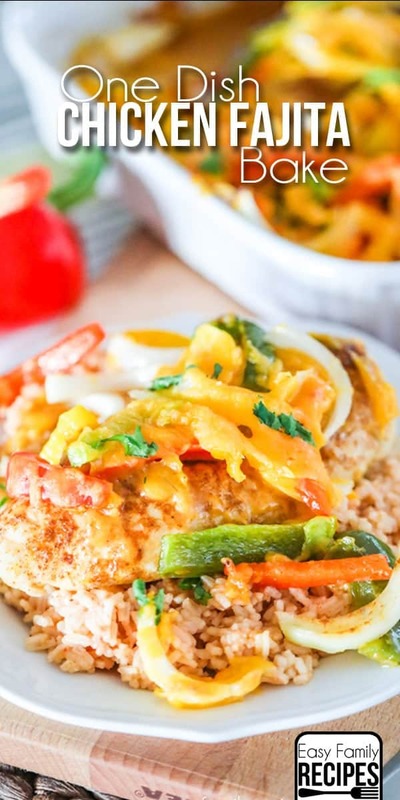 This baked chicken fajitas recipe is just plain delicious, and as a bonus also naturally wholesome. If you are following a specific diet, or have special dietary restrictions, this recipe can really fit the bill as well. This recipe, by nature, is low carb and can be easily made gluten free by using homemade fajita seasoning. It is popular among macro counters and in the paleo and keto communities as well. If you are looking to lighten up the recipe or make the recipe low carb, I suggest serving over a bed of sauteed spinach, or over this delicious mexican cauliflower rice. I could eat that stuff all day! Although, I recommend using a nutrition calculator for the exact brands and ingredients you use in the recipe for an exact count, I do include my estimations for the breakdown in the recipe card below. If you hang around you will find that I always post the recipe card for any meal at the bottom of the post, but in this section I will go through the recipe step by step and answer most questions you might have. So follow along here to get my tips and tricks, or skip to the bottom for the quick view. 3-4 chicken breasts– If you have extra large, thick chicken breasts, you may want to cut them in half so they are half as thick, if your chicken breasts are small-medium then I recommend using 4. 1 tbsp taco or fajita seasoning (use this homemade fajita seasoning for gluten free option) – I generally use McCormick taco seasoning. 1 1/2 sweet bell peppers, thinly sliced (any combination or green, red, orange, yellow)- I like to mix it up with a few colors to make it pretty, but you can use all one color or a mix, it doesn’t matter too much for taste. Make sure the slices are fairly thin so it can cook as evenly as possible. 1 medium sweet yellow onion, thinly sliced- You can also use red onion if you prefer it. Make sure the onion is sliced thin so it cooks through and the sweetness comes out. 8 oz sharp cheddar cheese, shredded- You can substitute mexican blend here, but I like sharp cheddar because it gives the most flavor with the least amount of cheese. If you are really watching calories, you can even reduce the amount a little without impacting the final dish. 1 tbsp chopped cilantro, for garnish (optional)- If you like cilantro, I find this to be a great little extra, but it by no means is the most integral part of the dish. Lay the chicken breasts flat in a baking dish big enough where they aren’t quite touching, then sprinkle the fajita seasoning evenly over them. You want to make sure that you aren’t making everything too packed in here or it will take a long time to cook. Use a dish big enough so that the chicken breasts don’t quite touch. Mix the bell peppers and onions and spread them evenly over the top and place the cheese over the top of the peppers and onions. Again, just make sure you aren’t packing it in too tightly. Go up a dish size if you need to! Bake on the middle rack of the oven for 30-40 minutes or until the chicken is done through (min of 165˚F in throughout. You shouldn’t need to cover this dish. By baking uncovered it allows the extra moisture from the chicken and veggies to cook away and not accumulate liquid at the bottom. Every oven cooks differently though so if you find the cheese getting browner than you want, just lightly cover it with foil from that point on.Also, each oven will cook differently and the cook time will also be effected by altitude, climate, and oven size, so please check to make sure your chicken is done through. Try not to over cook since that will lead to tough and rubbery chicken. Garnish with chopped cilantro and serve hot over rice, cauliflower rice, greens, or in tortillas. My favorite low carb options are sauteed spinach and mexican cauliflower rice. I have also been known to mix cauli rice and regular rice and my kids don’t even realize that 50% of the volume isn’t even rice! Enjoy! If you have leftovers, you can chop or shred the leftover chicken and use it in tacos, enchiladas, nachos, salads, or tostadas to name a few. I hope you love this recipe as much as our family! Baked chicken fajitas are easy and delicious and you can find it on our table at least once a month! If you have a chance to try it out, I would love to hear about it in the comments! Or snap a pic and tag me on Instagram @easyfamilyrecipes. I absolutely love to see others enjoying my food! It would make my day! 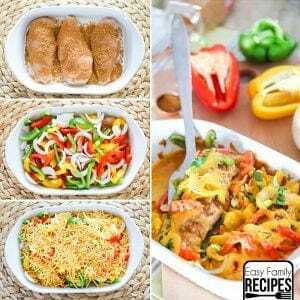 A quick, easy and healthy baked chicken fajita recipe. Lay the chicken breasts flat in a baking dish big enough where they aren't quite touching, then sprinkle the fajita seasoning evenly over them. Mix the bell peppers and onions and spread them evenly over the top and place the cheese over the top of the peppers and onions. Bake on the middle rack of the oven for 30-40 minutes or until the chicken is done through (min of 165˚F in throughout. Garnish with chopped cilantro and serve hot over rice, cauliflower rice, greens, or in tortillas. Can one add mushrooms to the pepper and onion mix before baking the oven chicken fajitas? Yes I think that would work well and be delicious! Do you have instant pot recipes? This recipe looks great. This looks so easy and delicious! I will eat anything Mexican, anytime. Could you use a frozen pepper and onion blend instead of t fresh peppers and onions? Did you try this with the frozen pepper mix? I was considering making this if I could just dump a bag of frozen on top! Made this for dinner tonight and the family loved it! They said I could definitely make it again lol! I made this recipe, and I was light-handed with the fajita seasoning. Next time I’ll add more. I love cilantro, so next time I’ll add more of that as well. Thank you for this recipe! I am diabetic and eat low carb, and my daughter is gluten intolerant. My husband doesn’t usually care for our healthy recipes, but he was willing to taste it and said he would definitely eat it with those modifications mentioned. I’m a happy camper! Such a delicious recipe and so super easy! Thanks for sharing! Easy, delicious and will be made again! !